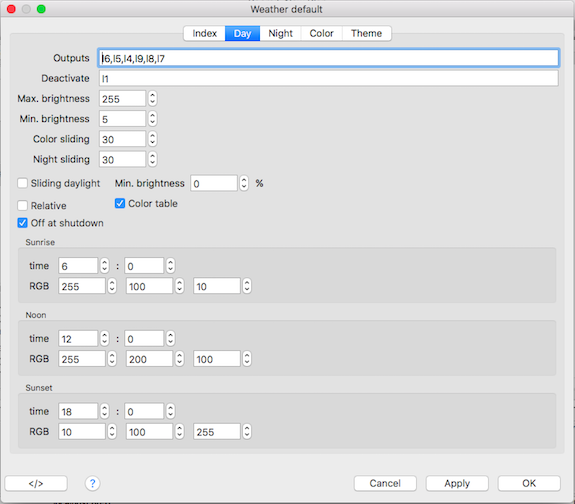 Controls the daylight with one or more bulbs defined in output objects. The output objects, lamps, to use for daylight simulation. The more lamps the better the result. The listed lamp order should be from east to west. Using an odd number of lamps will have the middle of the lamps located high south. Recommended is to order the lamps over the model railroad as a half circle. The segments between the lamps should be equally between all. 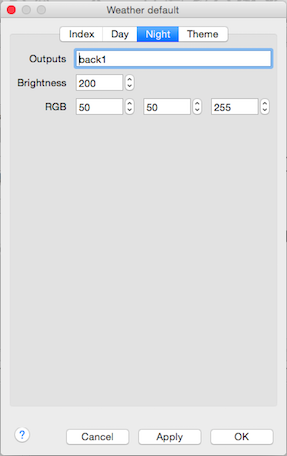 I valori RGB di alba è tramonto sono calcolati a/da mezzogiorno; a mezzogiorno il valore RGB è 255,255,255. The output objects, lamps, to use for nightlight simulation. La luminosità è impostata dal Valore dell'Uscita.